Our Strategic Plan 2014-2017 tells you a lot more about Glasgow Women’s Library, our background, what we plan for the future and how we will achieve our aims. The Equality, Diversity and Inclusion (EDI) Action Plan details how EDI shapes the work at Glasgow Women’s Library, looking at the period 2018 to 2021. We recognise that global climate change has serious consequences, and that its detrimental effects are disproportionately experienced by women. We believe that individuals, organisations, agencies and institutions must have a clear and embedded focus on environmental issues to redress the negative impact of climate change. Our collections are built on donations, and an ethos of sharing and lending is at the heart of our work. We have always worked with an awareness of our environmental responsibilities and instil these values and working practices throughout our Board, staff and volunteer team. Our Green Creative Cluster, a team of staff, board members and volunteers, meets regularly to develop and implement innovative and creative ways to reduce our carbon footprint. We are committed to minimising waste, working towards maximum energy efficiency, and to re-using and recycling resources. We also believe that as a library, museum, archive and arts organisation, we have a role in influencing our visitors and the wider community, and we are committed to fulfilling this role through the implementation of our Environmental Policy. This policy sets out how we put this commitment into practice. Our Collections Development Policy details the criteria governing future acquisitions & donations, as well as the disposal of donated materials not relevant to our collection. At Glasgow Women’s Library we are committed to, and actively celebrate, freedom of thought and expression. We aim to provide books on as wide and diverse viewpoints as possible, even if they may be considered controversial or unorthodox to some. All items in the GWL collection are donated and therefore represent a broad range of interests among our tens of thousands of users and donors. Providing a wide range of information is absolutely vital to ensure that we are meeting the needs of all our library users. It is also vital to ensure that we are preserving and documenting all aspects of women’s histories, lives and achievements, and making this information accessible for research purposes. The feminist movement has a broad range of thoughts, ideas and debates. We are committed to ensuring that this broad range is available for people to explore and discover for themselves. Where it is felt there are gaps in the collection, we will seek to address these within the context of continuing to build the collection based on donated materials. 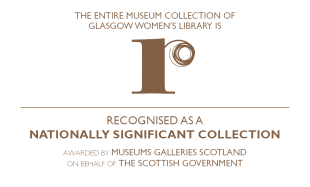 Glasgow Women’s Library is fully committed to ensuring that its premises, collections, learning programmes, range of events and all other services are fully accessible to the broadest range of visitors, project users and learners. Glasgow Women’s Library (GWL) cares about your privacy. We are committed to storing and processing your personal data safely and being transparent about all our privacy practices. Glasgow Women’s Library runs a full programme of Women’s Heritage walks throughout the Spring, Summer and into the Autumn. Here is our policy on what to do if you need to cancel your place and also what happens on the rare occasion that we have to cancel a walk. View the full Women’s Heritage Walks Cancellation Policy. Glasgow Women’s Library run a full programme of events throughout the year. We ask you to book for free and paid-for events as it helps us with our planning. Here is our cancellation policy and information about refunds, where a ticket price is in place. View the full GWL Events Cancellation Policy. Glasgow Women’s Library strives at all times to deliver high quality services, underpinned by our Aims and Core Values, to meet the needs of visitors, users, learners and the broader public. This Complaints Procedure operates across all aspects of our work. It applies to any formal or informal matter of concern expressed verbally, or in writing, to / from any member of staff, volunteer, visitor, learner or user. Glasgow Women’s Library welcomes complaints from those using our services and projects when the services provided have not met their expectations or needs. We are always very pleased to hear your views so that we can take steps to make our services and projects better.